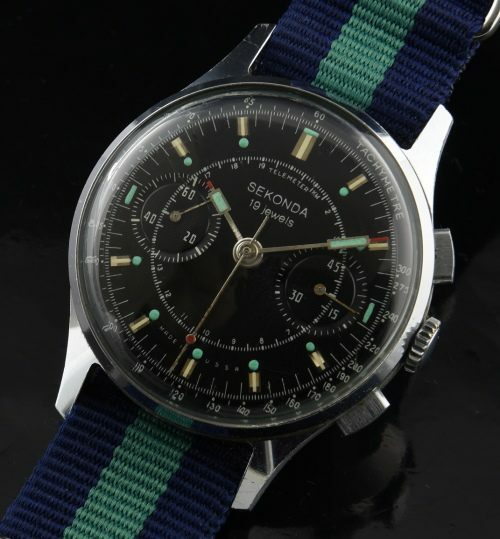 Sekonda (founded in 1966) watches are manufactured in Russia; and being a BRITISH company, were then distributed to the public. This circa late 1960’s example is one of the cleanest I’ve ever found. The chrome case measures 36mm. and looks like it was barely worn. The stunning glossy black dial and hands are pristine. I just love the lime green lume plots, hands and red accents. Those are just shadows on the dial in the photos. The fine chronograph movement is based on the Venus 150/152 caliber, just cleaned and is accurate. You will marvel over this example.